"Histories of Now: Time Diffractions, Virtuality, and Material Imaginings"
Karen Barad is Professor of Feminist Studies, Philosophy, and History of Consciousness at the University of California at Santa Cruz. Barad's Ph.D. is in theoretical particle physics and quantum field theory. Barad held a tenured appointment in a physics department before moving into more interdisciplinary spaces. Barad is the author of Meeting the Universe Halfway: Quantum Physics and the Entanglement of Matter and Meaning (Duke University Press, 2007) and numerous articles in the fields of physics, philosophy, science studies, poststructuralist theory, and feminist theory. Barad's research has been supported by the National Science Foundation, the Ford Foundation, the Hughes Foundation, the Irvine Foundation, the Mellon Foundation, and the National Endowment for the Humanities. Barad is the Co-Director of the Science & Justice Graduate Training Program at UCSC. 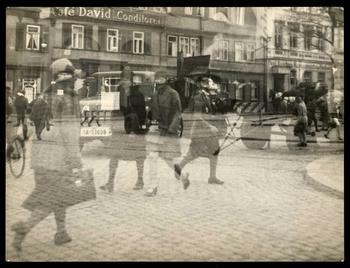 Image caption: Lyonel Feininger, Untitled (street scene, double exposure, Halle), 1929-30.